It's been quite a busy, week so this has been delayed again, I'm sorry about that. What's your favourite Base game box art? There have been several iterations of box design over the years, with variations of logos and awards, but this week we'll specifically ask you which artwork is your favourite, as opposed to overall layout/design. There are 4 main variations to consider - I'd like to thank GabrielGeek - who is a member here - who has allowed me to share an image he created for BBG, saving me the hassle of photographing everything So, please send him your gratitude. Early editions of the game come with a Knight and a Thief on the box art. Soon after the 2nd editions were printed, the thief had been exiled to a bush, while a maiden is present on the box art. I like to think this was because they thought that the box art would be more appealing to women. I also like to think she's in cahoots with the Thief, as their trick didn't work last time the night was in town. The third box, is very different. The castle has had a face lift and so have the Knight and Maiden - They're now smiling, even the horse, because the game is so fun - and there is no sign of the thief. The Thief has been replaced with a man riding a pig; which you should recognise as Hans from 'Hans im Gluck'. I'm not sure Doris Matthäus was responsible for this cover, her signature is missing. No doubt you'll all hate the new box art; arguing it's not accurate (The roofs ARE blue). Even though, there's a lot of stuff going on - the thief is back to his own tricks. The (somewhat creepy) shadow of the player can even be seen, breaking the fourth wall. It's clear there's adventure to be had in this box and you'll be part of it. Share your thoughts and let us know which if your favourite, or don't you care and do you need all 4 to be considered a completionist? I don't like the third one because, smiles disturb me ! I choose the second because, it's the one that I own, the box which made me mad about this game ! I went with I don't care only as it fits the best, but truth is, I never paid much attention to the box artwork so it's not that I don't care blatantly. This goes for box art in general. Don't care! It's what's inside that matters to me. I didn't realize until now that they pig rider cover was a completely new piece of art. I have Big Box 1, so whatever art is on that one is the one I have (it's the second box). I've never been that kind of collector, though. My Expansion #6 and Expansion #8 are both German-language copies, for example, and I own none of the boxes before Abbey & Mayor. I'd say the only box I may be interested in is the original Inns & Cathedrals box where it just said "The Expansion". That's be pretty cool. Also, none of your options above have "The River" printed above the gateway. Granted it was just badly included by RGG in 2001, but Z-Man did a better job of adding it. Oddly, Z-Man opted for the second box graphics rather than the third edition with the smiling knight and pig rider (which does appear on Big Box 5). 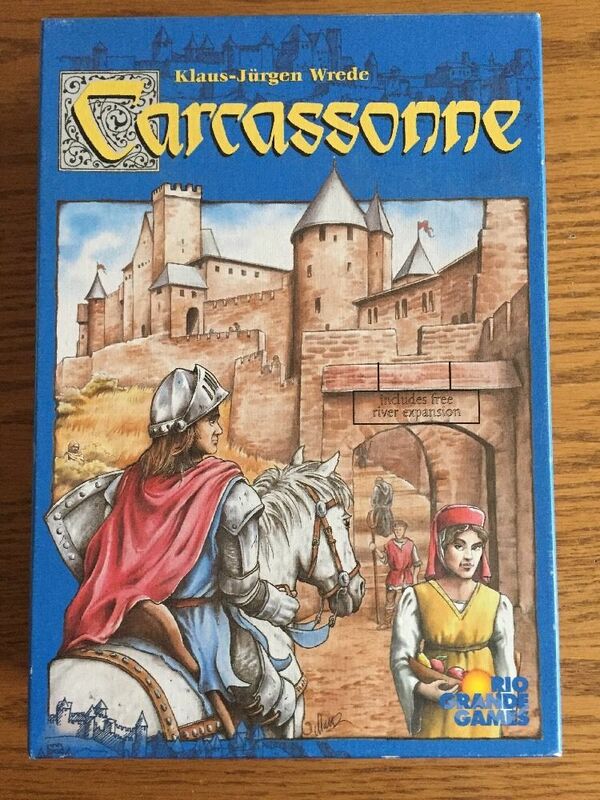 After 18 votes, it looks like 33% of you don't care as long at the Carcassonne II artwork isn't inside the box, with another 22% not even caring about that. I should forward this information to the Game's industry and recommend they just sell games in ziplock bags because no one cares! I intentionally left out the Rio-grande and Z-man abominations. Mainly, because they were bodged versions of the existing art and it would open the floodgates to weird versions like the Russian First Edition, or the Italian Edition that stuck a River Tile on the box, followed by every iteration of position of the SdJ logo. Secondly, I very much doubt anyone would actually vote for any of them, so I've only opened consideration to the HiG boxes here. 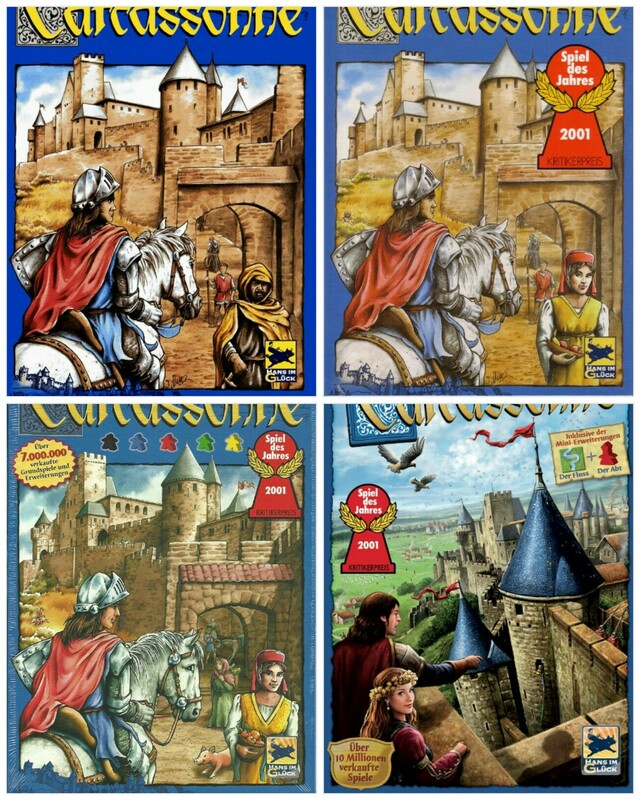 ...and you all thought the CarcassonneII artwork was bad! I'm happy with any of them but I never actually noticed most of the changes between the boxes on the original artwork. The one where everyone is smiling I find especially interesting as I feel it does actually make the game appear a little less serious thank the others do. This also got me looking at the box from the spare set I bought off eBay a little while ago and I noticed it has the 70 point score board on the back (although sadly not actually containing one)! I also wouldn't mind if Carc II was in the box. At least it would still be Carcassonne! Apparently I'm warming to the artwork a bit after showing people the demo tiles a few times. 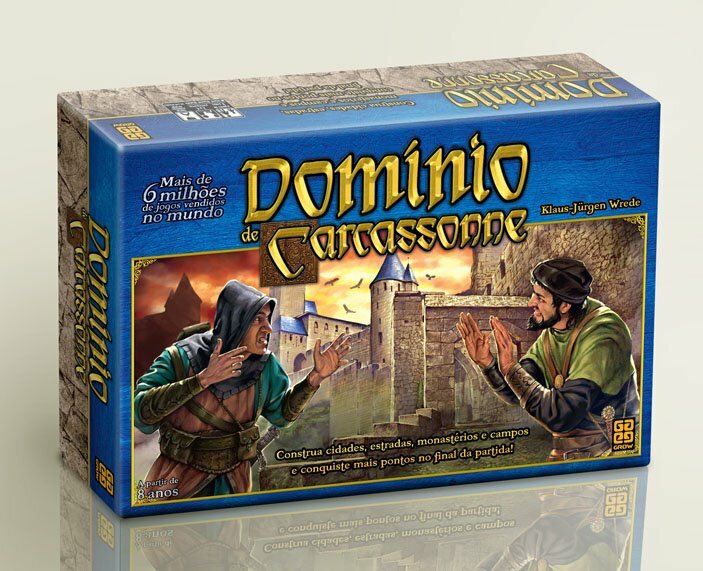 Edit: Also the Brazilian first edition looks like a totally different game, more like a duelling card game than Carcassonne. I voted for the 'Thief' mostly for sentimental reasons of our first owned edition, (which we still play with and is worn from hundreds of games). However, I've always thought the range of these covers were somewhat bland and designed to fit in along all the Euro games of the day. It might have a truer medieval feel, but kind of blah, non the less, (IMO). To be honest, (ducks for cover), and though it wasn't on the voting list; I like the Carc 2 cover art, other than the Disney looking main characters in the front, (yeah that almost kills it). But if I look past that I think it tells a more compelling story and I really like the landscape view showing the roads, towns and county side. I'll be ducking and covering with you - I think the new artwork tells a story and for Carcassonne to last another 15 years, it needed a refresh to jump out from the competition in the gamestore. I like the design from Doris Matthäus. I've voted for the edition from 2013 with the pig nearby the woman. And the "Hans-im-glück pig" is also in this graghics. But why is there no opinion in the poll for the graphics from Anne Pätzke with the new Edition? Whoops, there was meant to be one, I've added it now! 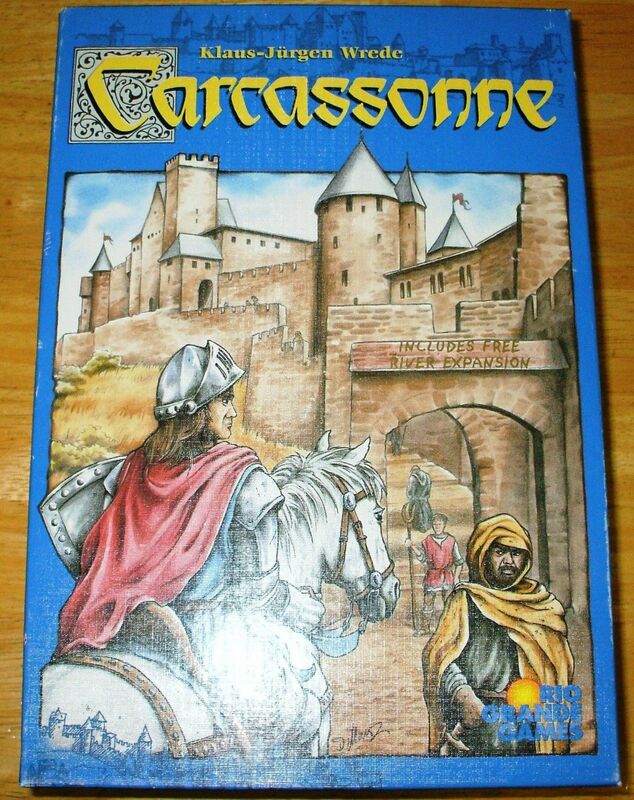 I thought the Carcassonne II box art was created by Chris Quilliams, rather than Anne Pätzke who did the nice tile artwork; perhaps I'm wrong, what did Chris Quilliams do? Decar, you are right - the cover from the new Edition is from Chris Quilliams, the landscape tiles have the artwork from Anne Pätzke. But what is with the Winter-Edition? Anne Pätzke did the graphics for the cover and for the landscape tiles. Yes I think so. Anne Pätzke also worked on 'Cornwall'. Winter Edition may be being included in a later poll. I never noticed the pig rider on my box before. Mine has the river, but no spiels de jahres mention.